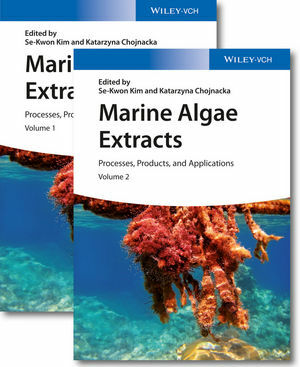 Designed as the primary reference for the biotechnological use of macroalgae, this comprehensive handbook covers the entire value chain from the cultivation of algal biomass to harvesting and processing it, to product extraction and formulation. In addition to covering a wide range of product classes, from polysaccharides to terpenes and from enyzmes to biofuels, it systematically discusses current and future applications of algae-derived products in pharmacology, medicine, cosmetics, food and agriculture. In doing so, it brings together the expertise of marine researchers, biotechnologists and process engineers for a one-stop resource on the biotechnology of marine macroalgae. Se-Kwon Kim is professor at the Department of Chemistry and Director of the Marine Bioprocess Research Center at Pukyong National University in Busan (South Korea). He received his academic degrees from Pukyong National University and conducted his postdoctoral studies University of Illinois, Urbana-Champaign (USA). Later, he became a visiting scientist at the Memorial University of Newfoundland in Canada. Dr. Kim served as president of the Korean Society of Marine Biotechnology and is a board member of the International Society of Marine Biotechnology and the International Society of Nutraceuticals and Functional Food. His main research interests are investigation and development of bioactive substances from seafood processing wastes and other marine sources. To date, he has authored around 450 research papers, has edited more than 20 books and holds 76 patents. Katarzyna Chojnacka is a full professor of chemical technology at Wroclaw University of Technology (Poland), where she also obtained her academic degrees. Her research is focused on biosorption and bioaccumulation and their technological application. She has published over 200 articles and written one book.